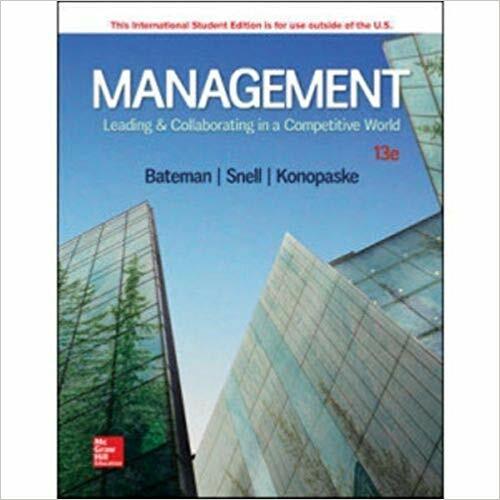 The mission of the 13th edition of Management: Leading & Collaborating in a Competitive World, by Bateman, Snell, and Konopaske, is to inform, instruct, and inspire students to learn about management so they become thinkers and doers who succeed in today’s workforce. It emphasizes six essential performance dimensions: cost, quality, speed, innovation, service and sustainability. This results-oriented focus delivers value to the customer and a competitive advantage to managers and their employers. Its cutting edge topical coverage draws from a wide variety of subjects, sources, and personal experiences. Ongoing themes include real results, ethics, culture, leadership, and collaboration.